Spanning the gambit of known delay possibilities and beyond, the Echosystem could be the ultimate delay-crafting tool. 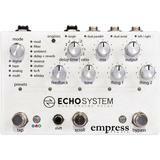 Faithful emulations of classics like digital, tape and analog delays are numerous, as well as Empress' own take on each of these delay styles. Moving beyond the traditional, the vast amount of sonic ground the Echosystem can cover becomes apparent. Check out the ambient modes when you're feeling chilled out, or perhaps a visit to the multi tap modes for a taste of inspiration. Cabinet Simulator - 3 variations to choose from, perfect for recording, practising or for gigs without an amp.